THIS MACHINE HAS BEEN DISCONTINUED - See the iQ-400. Designed and manufactured based on customer needs and opinions expressed over Strapack's extensive history of manufacturing quality strapping machines, the JK-2 guarantees satisfaction in various types of applications. JK-2's innovative new features include feed length memory, adjustable table height, easy strap width conversion, capability of soft tension and replacement parts. 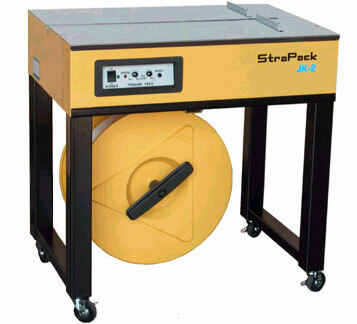 The Strapack JK-2 is ideal for industrial applications where dirt, dust and grime may affect performance of other table-top machines. It has a compact footprint, and advanced diagnostic capabilities. When engaged, the diagnostic mode steps through the sealing process one step at a time. By observing the operation of the JK-2 in this special mode, it is easier to identify problems and make adjustments. This machine is easily shipped. Please call one of our friendly machine specialists if you have any questions. Call or contact us today for a machine demo (Southern California Customers Only). Package Minimum- 3-1/2" x 1-1/8"
Strap Widths Accepted- 1/4" x 3/8" and 1/2"